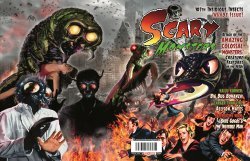 MyMovieMonsters.com > Scary Monsters Magazine > Scary Monsters 101-Current > Scary Monsters magazine #107 - Insidious Insects Invade Issue! They're creepy and they're kooky, mysterious and spooky, they're altogether ooky ... no, no, not that family! We're talkin" the slithery, slimy and spiny colossal creatures you'll find in the Scary Monsters 107th Insidious Insects Invade Issue! In 146 pages of vintage monster mayhem, we cover the giant bug film genre that got its legs in the 1950s when Them! raised the ante and gave every moviegoer the horrible heebie-jeebies! We also dare to take a closer look at other attacking insects that flew, crawled and hopped across the silver screen over the years. Plus lots more scares, including regular favorites: Dr. Gangrene's Mad Interview, Kaiju Korner, Strange Days, and Weird USA! Full color wraparound cover art by Scott Jackson and vintage B&W content with 146 vintage pulp pages for Monster Kids of all ages! Published January 2018 by Rondo Award Winners and Monster Kids of the Year, Don and Vicki Smeraldi of MyMovieMonsters.com. Here is Dr. Gangrene's sneak preview of Scary Monsters #107!